Displaying a prototype of a Susquehanna County Heritage Attractions sign that will be installed in Montrose in the spring are (top, from left) Susquehanna County Free Library director Susan Stone, Susquehanna County Historical Society Museum curator Betty Smith, Montrose Borough Council member Craig Reimel, Montrose Restoration Committee representative Brian Leone, Historical Society board member Rick Ainey, board president Tom Kurosky, and board member George Conner. The intended location for a new sign will be the front lawn of the museum facing Monument Square in Montrose as shown by Smith (above). 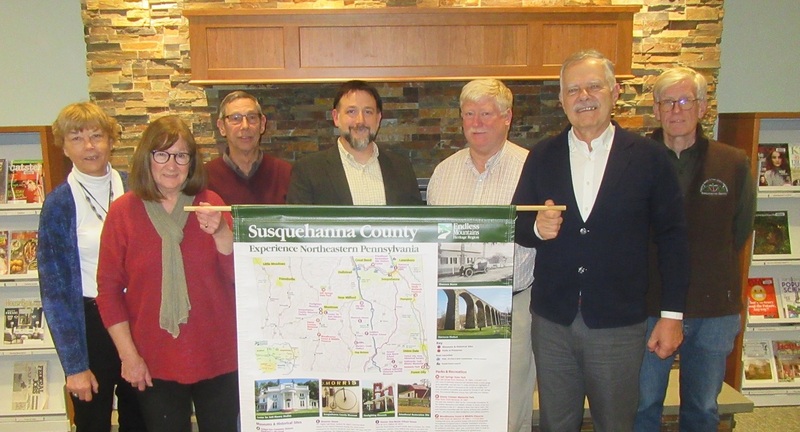 The Susquehanna County Historical Society will be the recipient of an interpretive panel and map detailing more than two dozen historical sites, trails and scenic byways, parks and preserves, and river access points in Susquehanna County. The sturdy three-by-six-foot Heritage Attractions sign is tentatively scheduled to be permanently installed on the lawn of the Historical Society’s Museum in Montrose facing Monument Square in April 2018. The first such sign, created last year by the Endless Mountains Heritage Region (EMHR), was installed in Forest City to celebrate the borough’s position as a trail head along the D&H Rail Trail, as well as the culmination of the renovation of downtown streets and sidewalks. Similar signs depicting heritage attractions in Bradford and Wyoming counties have been placed by EMHR in Towanda and Tunkhannock, respectively. Historical Society board members met with an EMHR representative last week to get a look at a prototype of the sign and to gather details needed for its installation. Also participating in the discussions were representatives from Montrose borough, the Susquehanna County Commissioners and the Montrose Restoration Committee. Primary considerations were that the sign be visible, accessible and appealing while also not serving as a distraction to drivers. Three sites in the borough of Montrose are depicted on the sign, including the Museum, the Center for Anti-Slavery Studies, and the Fire Company Museum. Project planners realized that the description for the Museum needed to be updated as the original sign makes references to the sharing of the building on Monument Square with Susquehanna County Free Library until this year. Other sites depicted on the map are Old Mill Village, the Starrucca Viaduct, The Anthracite Coal Miners Memorial, the Priesthood Restoration Visitors Center, and Salt Springs State Park. Site descriptions include GPS-compatible addresses and contact information to enable those viewing the sign to learn if the site is open and accessible. The intention of the EMHR in developing the signs is to foster community pride for heritage assets and to promote how much each respective county has to offer. “The Endless Mountains Heritage Region is dedicated to advancing heritage tourism, and placing signs in historic downtowns is a great way to get the word out to residents and visitors alike,” Schultz stated. “It is a reminder of their ready access to our history and scenic beauty,” Smith concurred. The unveiling of the new sign will coincide with a public ceremony and media event coordinated by the EMHR. Representatives of each of the county-wide entities highlighted on the sign will be invited to participate. 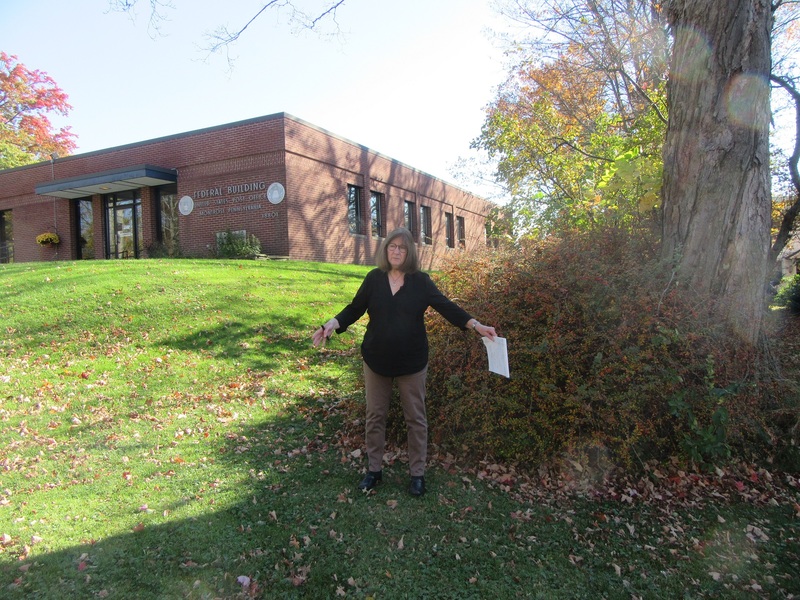 The Susquehanna County Heritage Attractions signs were made possible by a grant from the Endless Mountains Visitors Bureau County Room Tax fund with matching grants by the EMHR and PA DCNR.